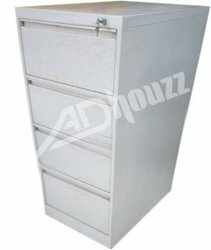 File Cabinet is provided for ready to use spaces for meeting the storing requirements of files and folders. Providing for convenient storage option, these presence of these cabinets also ensure all files and folders are maintained in a well organized way for easy handling and reference when required. Some of its features include coming with smooth drawer movement, anti-tipping support which ensures opening of one drawer at a time, Available in multiple drawer options as specified by the customers, powder coated finish for corrosion resistance and long lasting durability and others.